The 2018/2019 Head Raptor 140 RS was tested in the men's Frontside category at Silver Mountain Resort by the experts at America's Best Bootfitters, powered by Masterfit. Testers said skiing in the 2019 Head Raptor 140 RS is a little like seeing a big arena show featuring your favorite rock band from the early 70's, and they don't play any of their new crap—they play all the killer old stuff and they sound every bit as good! 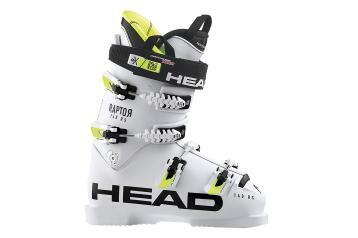 The Raptor 140 RS has been, and remains, the perfect Frontside boot, say testers, so why would you change it—and they haven't over the years, save some minor cosmetics and liner tweaks. Returning unchanged this year from last, testers comment that it's lasted so long in its current form that while other boots have gone too upright, its cuff angles of yore are now a welcome, refreshingly aggressive throwback. Now that other narrow boots have begun to feel like wides, putting on a--damn, that's tight--Raptor has become a breath of fit tension fresh air. The Raptor's fit is straightforward—tight and right. Testers gave it 1's and 2's--1 is true race boot tight--but also commented that there's enough shape built-in to house the common bony prominences and wider areas, but just barely. The liner is thin and dense, but padded just enough to separate bones from plastic and provide a well-wrapped and connected fit. The sense that the ski is not far from the foot is a common mention on test forms. The flex feel is a strong 130, so sure, 140 works, but the feel on the leg is accessible to good skiers—this isn't a World Cup race boot. Yes, testers mention some spots that'd need work for their particular hotspots (styloid process is a common one in the Raptor) but that's what a monoinjected polyurethane shell, cuff and a good ABB bootfitter are for. The Raptor 140 RS fits traditionally lengthwise (i.e. not overly long), so if the other narrows seem to be growing of late, this will remind you how they’re supposed to fit. The stance set-up is strong, meaning with a little extra oomph to the inside edge, and this, along with the beefy, solid-sole lower boot construction and a bolted cuff, creates monstrous leverage over the ski for sick-and-wrong trenching on-piste. Note that out of all its many tests, it maintained a perfect score for Edge Power and Stability. It's just as strong off-piste, but it's not forgiving of mistakes and is transmissive of terrain hits back into the skeleton—so, highly skilled all-mountain skiers will be thrilled, but keep in mind a smooth surface is the Raptor's native habitat. Most testers find the fore-aft stance just right without the rear spoiler installed, which is the way the boot comes boxed. The Flex Performance tuning anchor for shell and cuff is designed to be drilled and pinned for an even stiffer flex rating—you won't need it, just make sure the one set-screw is tight and then fuggetabout it! Old school racers who've tried going wider and softer and hated it--well, come back home. Testers like the Double Power Booster power strap that combines a Booster strap with a three-to-one mechanical advantage pulley for serious leg wrapping crankage and a snappy return to center. Dual-side cuff adjustment is a worthy amenity for fine-tuning edge angles, and the Spine Flex buckles wrap the radius of cuff and lower boot (and very few complaints about them from testers this year, they've pretty much given up).